DMT Diamond Sharpener 2 x 6 x 1/4 inch. 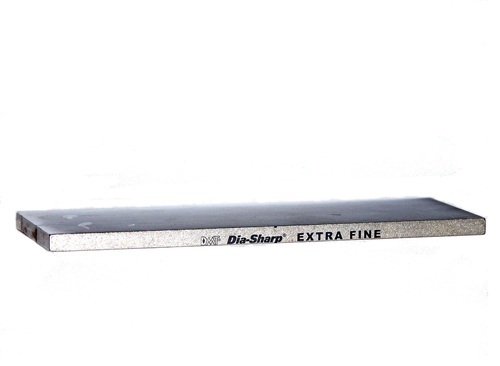 Extra-Fine (9 micron / 1200 mesh) to polish and refine a razor edge after sharpening with a coarser diamond. The 6 inch sharpening stone includes non-skid rubber feet. Grit clearly marked on side of stone. Expect cutting edge performance with the DMT(R) Dia-Sharp(R) 6 inch continuous diamond sharpening bench stone. For knives blades and fine tools.